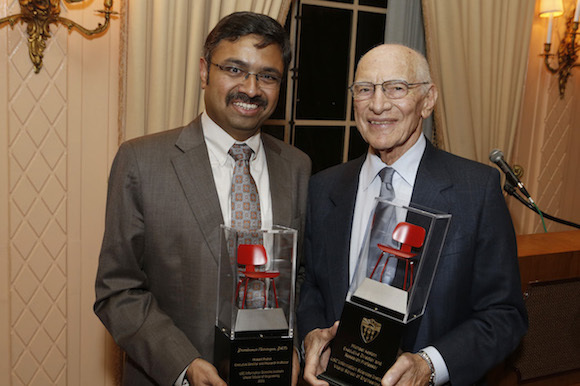 In November 2015, the USC Information Sciences Institute received its first-ever philanthropic gift: the Michael and Linda Keston Executive Directorship Endowment. Under the stewardship of inaugural Michael Keston Executive Director Prem Natarajan, the endowment is advancing the Institute's mission to conduct groundbreaking research in diverse scientific areas. These include artificial intelligence, computer architecture, bioinformatics, information and data management, quantum computing, networking, communications technologies, and social analytics. Michael Keston has a lengthy and distinguished relationship with USC. He has served on boards and executive committees, and has taught in the university's real estate development program, for more than 20 years. As an entrepreneur and philanthropist deeply involved with the university, Keston and his wife contribute to causes they consider important to the world – and to people with whom they’d like to work. ISI’s talented, wide-ranging researchers quickly caught Keston’s attention. "When I became aware of the technological advances that were taking place at ISI,” he says, “the engineer in me wanted to be a part of what helps them occur." Natarajan's goal is to ensure ISI's ongoing vitality and success by investing in new ideas and initiatives with potential for creating global impact. He also maintains an active research portfolio of his own, leading teams in forecasting, computer vision, and image and multimedia analysis. Funds provided by the Keston gift will sponsor an ISI researcher-in-residence position, the first of whom is expected to focus on predictive analytics and forecasting. The researcher-in-residence program provides talented individuals with a unique opportunity to pursue creative research in areas broadly related to information sciences. Young, innovative researchers will be able to apply their knowledge and scientific curiosity to create groundbreaking technologies, without administrative or other distractions, for one to two years. The Michael and Linda Keston endowment will help diversify the Institute's research portfolio by recruiting and funding researchers-in-residence. Individuals will be aided by ISI's exceptional scientific and educational environment, and by its large, deep pool of world-class researchers. For a detailed description of the researcher-in-residence program, click here. Below: celebration dinner installing Prem Natarajan as inaugural Michael Keston Executive Director of ISI.